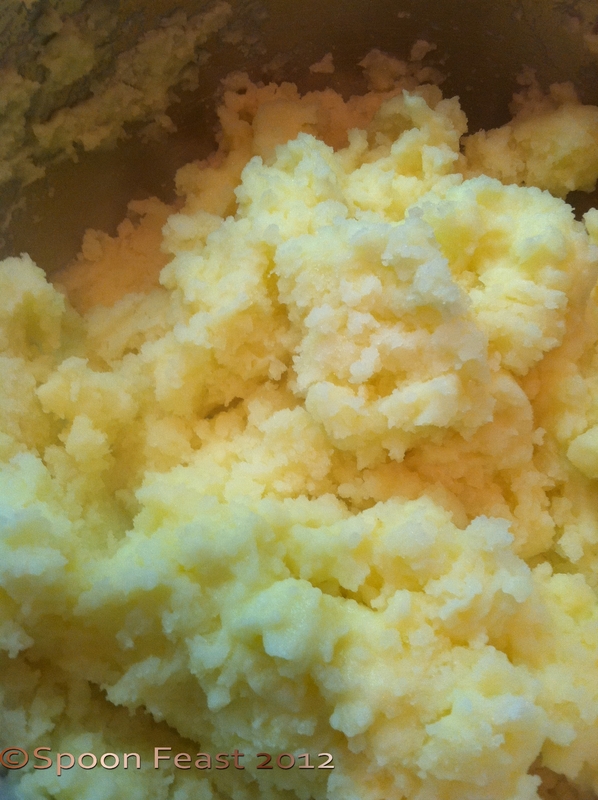 To make perfect mashed potatoes, you need to use the right kind of potato. Russet potatoes are the potato of choice because of their high starch, low moisture content. Read All about Potatoes to learn which kind you choose for different dishes. 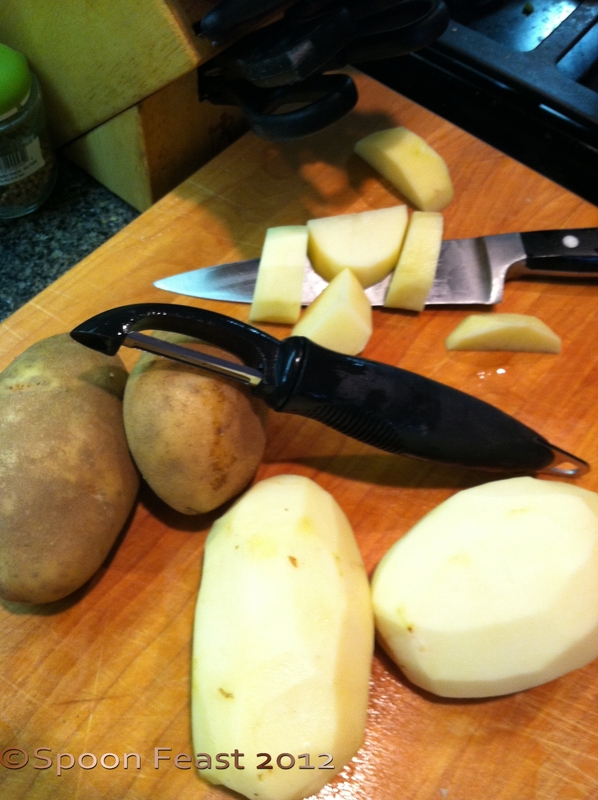 Wash, peel and cut potatoes into uniform sizes so they cook at the same rate. Wash and peel to potatoes. It is advisable to use 1 potato per person plus 1. Left over mashed potatoes can be used in many ways and you will be lucky if there are any left over. Put the cut potatoes into a sauce pan and cover them with COLD water. 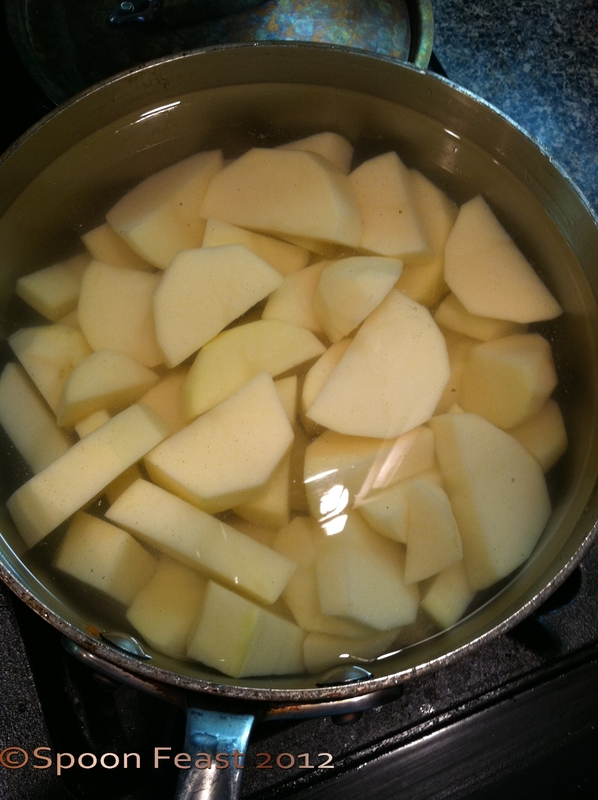 Cover cut potatoes with cold water; bring to a boil. Once the potatoes boil, add salt. Please don’t forget to add salt while boiling the potatoes. If you do, you will be left with very bland potatoes. Remember potatoes absorb flavor best while hot. When the potatoes are cooked, drain. 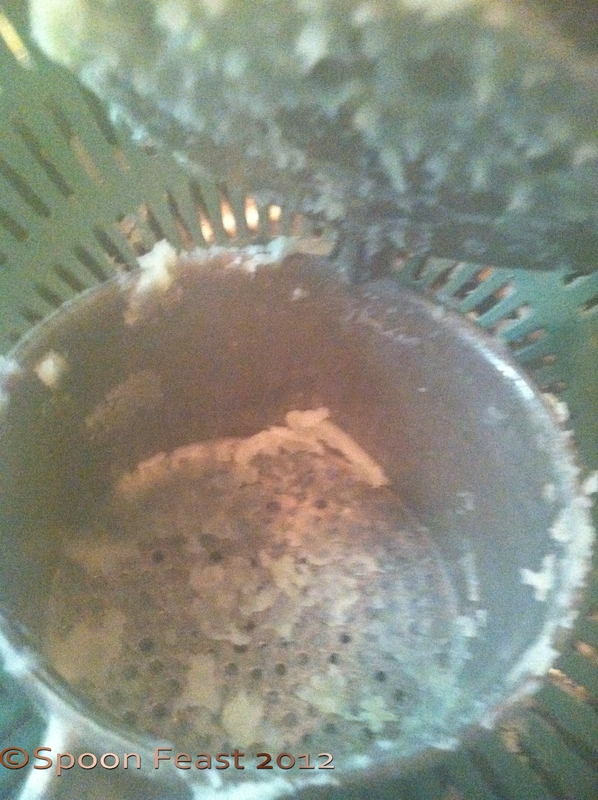 Process the potatoes through a ricer to produce perfect mashed potatoes. Once the water comes to a boil. test to see how done the potatoes are. They should be almost done when they come to a boil. Drain the potatoes when they are done. 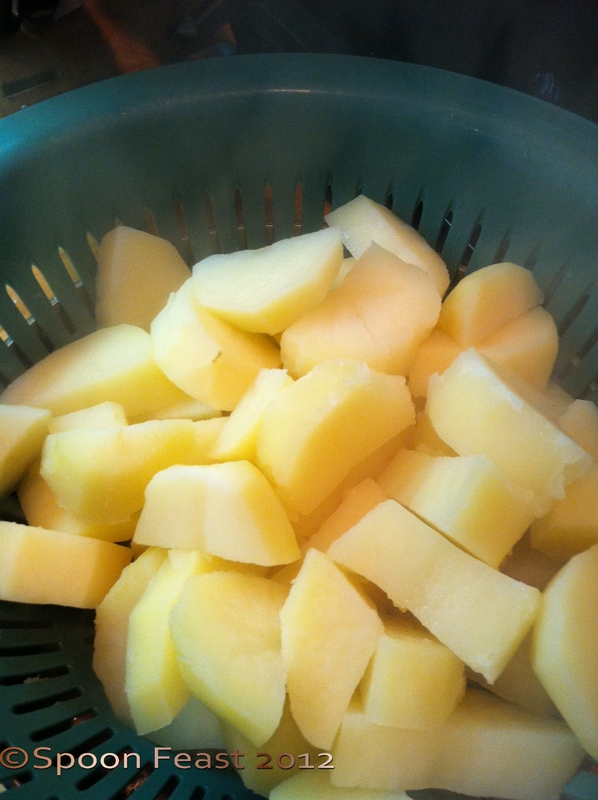 Press the cooked potatoes through a ricer to get a fluffy lump-free texture. A ricer is a good investment. This one belonged to Tyler’s grandmother. She used it to make spaetzle and soup noodles made with Romano cheese and lemon. After ricing your potatoes will be light and fluffy. In a small sauce pan, Bring 1/2-1 cup of cream to a boil. Add 2-3 tablespoons of butter to the hot cream, melt the butter. Carefully add just enough hot cream and butter to the potatoes to just moisten them and bring them together. 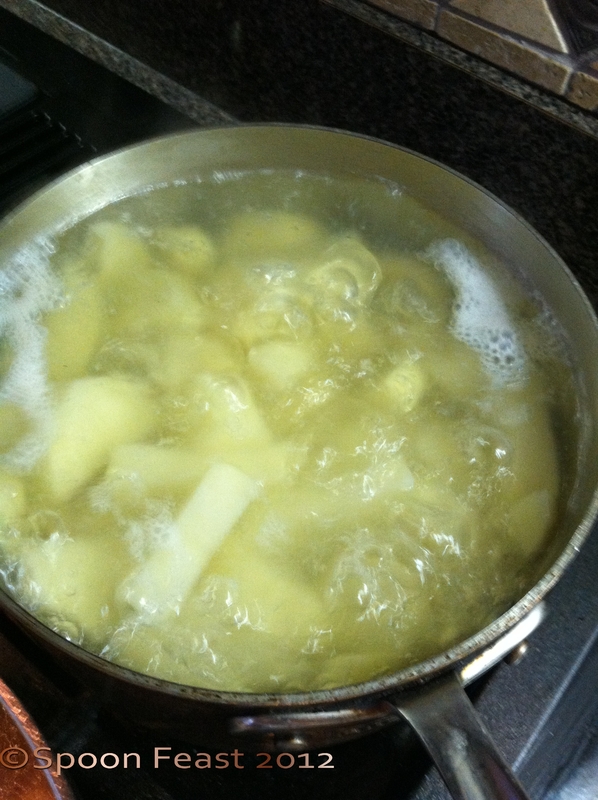 Be careful of over stirring which would cause the potatoes to get gluey, which isn’t very appetizing. Adjust the seasonings with kosher salt and white pepper (so you don’t see black pepper flecks in the nice white potatoes). To serve, you can mound them with a spoon, scoop or my favorite way is to pipe them out using a smooth tip, in decorative designs on the plate. We used to do this at the restaurant and I always loved how it looked. 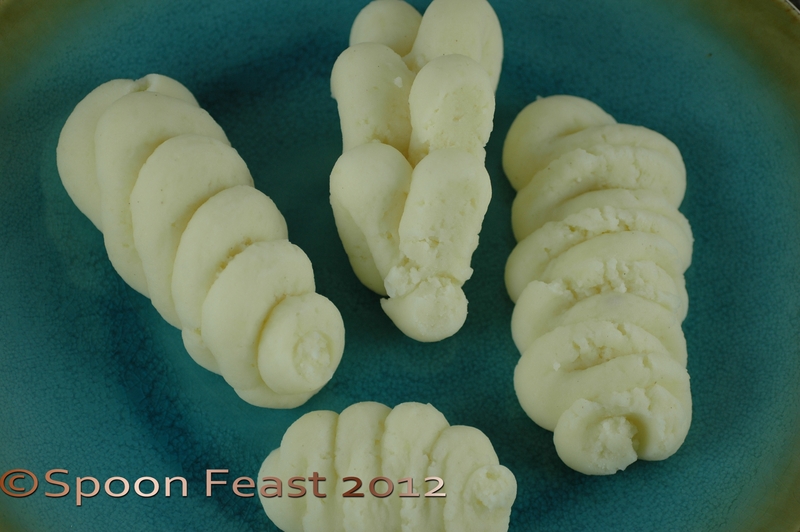 These are some of the ways to pipe mashed potatoes onto a plate. So, there you have perfect mashed potatoes. What can you do with left overs? Make potato pancakes, add scallions and make potato scallion cakes, use them to thicken cream soups. Use left over mashed potatoes to top a casserole or to make Shepard’s Pie. If you wanted to make them more low-fat, skip the cream and butter and use chicken stock instead. I would still use a bit of butter, but you won’t need much. This entry was posted in Recipes and tagged Butter, cook, Home, Mashed potato, Potato, ricer. Bookmark the permalink. It’s another butter delivery device Gary. Thanks Uru! mashed potatoes are one of the worlds greatest pleasures. the piped ones look so cute! your son will become very popular with all these useful recipes. He says he uses all the recipes. His girlfriend just got back from summer break so I am looking forward to hearing what she thinks of his cooking skills!